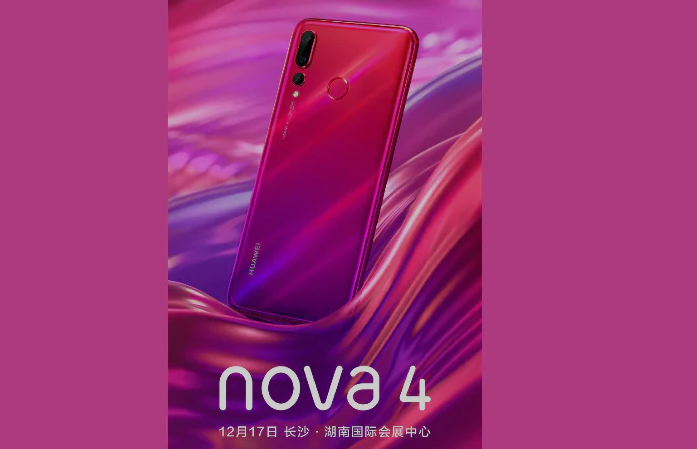 Huawei’s new upcoming smartphone Nova 4 is speculated to hit the market in end of December 2018. According to reports, a number of rumor threads are going strong, and the rumor is at boost after the latest addition about Leaked Huawei Nova 4 Specs sheet, that hints about the possible specification of Nova 4, the upcoming device under Huawei’s fame. 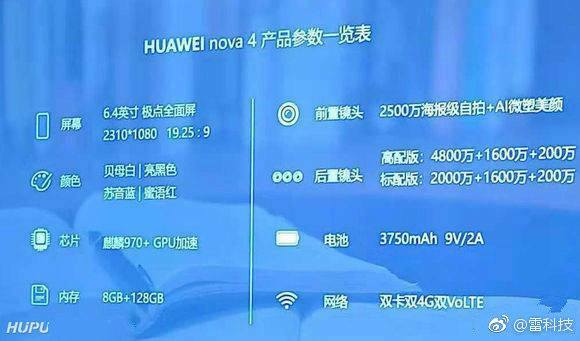 As per a post on Weibo, the Huawei Nova 4 smarphone is said to be powered by company’s own chipset, that is Huawei Nova 4 Kirin 970 SoC. Apart from this, the smartphone will equip 8GB of RAM, alongwith 128GB of inbuilt internal storage memory. Through Huawei Nova 4 Specs Leaked sheet, the device’s screen is expected to span 6.4 inch with in-hole display feature for really thin bezels. Screen’s aspect ratio is rated at 19:5:9 with resolution rate 2,310 x 1,080 px. Talking about camera features of Huawei Nova 4, it would have 3 rear camers with 48MP, 16MP and 2MP, however, the front selfie camera would have 25MP with support for AI camera features. In addition to this described variant, Nova 4 could also be available in variant which would have different camera specifications. Reports state Nova 4’s other variant could have 20MP, 16MP, and 2MP rear camera with same specs for front snapper as the first varaint. Experts clears the aforesaid details are just based on Huawei Nova 4 Specs leaked sheet, and can’t be deemed as a fact because there’s no solid proof to support it. To provide complete real details about device, we should wait until Nova 4 is officially launched, that is dated on December 17th.